Bathrooms are prime ‘hot spots’ for household mould. Your bathroom can be a breeding ground for mould and mildew, largely due to poor ventilation, water and humidity sources. Use Concrobium Mould Control to eliminate mould in shower stalls, bath tubs, behind toilets, in cabinets and on ceilings, tiles and walls. Spray Concrobium Mould Control to affected areas and allow surfaces to dry completely. A thin, even application is all that’s required. Clean the surface with a Concrobium-dampened cloth or brush. Ensure there is a nice even coat left on the surface after cleaning to help provide mould resistance. For areas like shower stalls and tubs that receive large amounts of dousing, apply Concrobium Mould Control every 1-2 months to re-apply the preventative microbial barrier. Help prevent mould by ensuring proper bathroom ventilation. 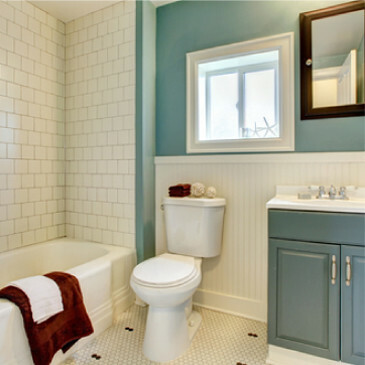 Ensure a ventilation fan is properly installed and run it often to reduce bathroom humidity. Spray Concrobium Mould Control on the mouldy surface, allow to dry. Make sure the surface is completely dry prior to application; a thin, even application is all that’s required. Clean the surface with a Concrobium-dampened cloth or brush. If mould staining remains, you may have to take additional cosmetic steps like re-painting, or try using Concrobium Mould Stain Eraser to remove deeply embedded or stubborn staining left by mould to improve the look of the surface. As a final step after cleaning, reapply Concrobium Mould Control to leave a thin layer of the solution on the surface to protect against future mould growth. As bathrooms receive repeated exposure to water and humidity, you may be required to reapply the product every 1-2 months or as required to ensure resistance against mould re-growth. Spray Concrobium Mould Control on the affected caulking & grout and allow to dry. Make sure the surface is completely dry prior to application. Because tile grout and caulking is quite porous, mould that has grown into it over the course of time may be very difficult to remove. Use Concrobium Mould Control with a stiff bristle brush to scrub the affected surface to eliminate tile grout mould. For tough and embedded black mould stains, try our Concrobium Mould Stain Eraser. If grout is very mould-stained, you may need to reapply the Concrobium Mould Stain Eraser and apply a light agitation. If these attempts are unsuccessful, you may need to replace the grout/caulking altogether. Spray Concrobium into the cavities once you’ve removed the grout/caulking – and then spray the newly-applied grout for mould prevention. Finally, re-apply Concrobium to leave a thin layer of the solution on the surface to protect against mould. Reapply as required, depending on the amount of dousing the surface receives. As water accumulates behind toilets and bathroom fixtures, these areas can become prime targets for mould and mildew growth. Be sure to clean these spots regularly to ensure that water is quickly removed from the area. If leaky pipes or condensation create moisture issues in these areas, be sure to address the issue, and treat the area with Concrobium Mould Control by applying the product in a thin, even layer over the affected surface to eliminate existing mould and prevent re-growth.